A delicious recipe of Turkey and White Rice made with all-natural ingredients with no artificial colours or flavours. Cats can suffer from food allergies, giving rise to poor skin and coat condition as well as stomach problems. The most common allergens are milk, beef, and wheat. So, unlike most other brands James Wellbeloved cat foods do not contains any of these problem ingredients. And because turkey is an uncommon protein source, it's great for a hypo-allergenic diet. 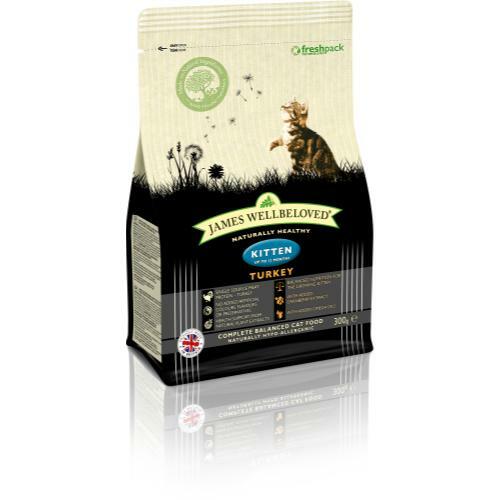 All of our James Wellbeloved kitten range offers a natural approach to digestive and urinary tract health.